Experience the most comprehensive and integral Ayurvedic counseling program for yoga teachers, healers and health and wellness enthusiast and practitioners. This integral certification program is ideally suitable for yoga teachers, health practitioners and those interested in lifestyle enhancement. The program aims to present ancient ayurvedic wisdom in a practical manner to promote health and wellness, through the prevention of common health issues and the promotion of ayus or longevity through diet, harmony with the cycles of life and synergy of the mind-body relationship. The course is focused on improving the sacred and eternal mind-body relationship through seasonal synchronicity (ritucharya), detoxification (pancha karma) and with a strong emphasis on psychology (manasa shastra). The program also holds to a strong foundation of therapeutics combined with spirituality, as found in the traditional form of Ayurveda taught in India. The ACP provides a well-rounded educational experience in Ayurveda’s fundamental principles that embraces counseling, therapeutics and lifestyle. Let us know if you are interested in becoming affiliated with Dancing Shiva to offer this special program at your yoga or health and wellness center. Participants have the opportunity to study Ayurveda in India to deepen their knowledge of this healing tradition as it is practiced in the motherland. This is truly a unique experience that will enhance your understanding of Ayurveda and everything that you studied during part one will make much more sense. For complete information about the program please download the catalog. 2. Live Classes (dates listed below). 3. Online Classes - Online classes ~ 1st 4 Weds of month & 1st & 3rd Tues of the month. I feel so fortunate to have the opportunity to study Yoga and Ayurveda with Mas Vidal. This experience has provided a much deeper and meaningful practice in every aspect of my life. His own experience and example of the yogic lifestyle is refreshingly honest and inspiring. I would recommend the study program to anyone wishing to learn Ayurveda, yoga and the integral wisdom of the Vedas. 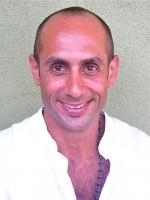 As a graduate of the Mas Vidal's Dancing Shiva programs it has been so insightful and life-changing learning Ayurveda. Integrating the ancient knowledge of the Vedas into my daily life has been very healing and nourishing to my body, mind, and spirit. I have had the opportunity to learn integral Yoga and Ayurveda under the tutelage of Mas Vidal and it has brought a new sense of enlightenment into my life. Learning the essence of the ancient Vedas and how profoundly they tie into daily life is absolutely fascinating. Although ancient, these teachings are so relevant to today's day and age and through with his many years of life study, the wisdom dances with mindfulness that he taught me to entwine with my newly discovered awareness.